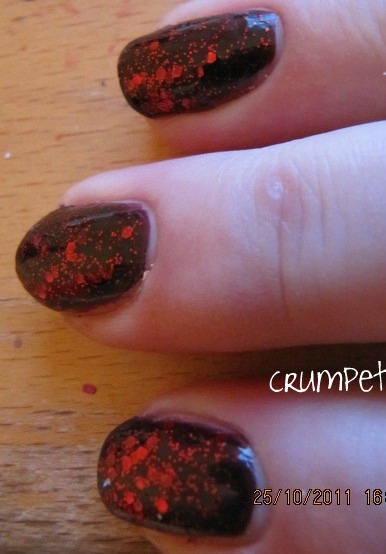 The Crumpet: The 5th Best Nail Polish of All Time ?? This is the 3rd post I am rebooting from my “newborn” days. 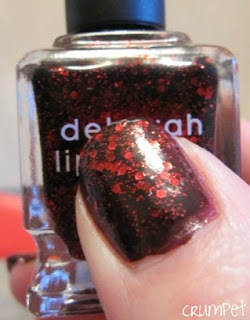 When I was compiling my Top 10 list of polishes, I really was embarrassed by what I had done for this Goddess. The photos were sloppy as was the painting – I think I used just 1 coat, and thought “ah, that’ll be enough”. Can you believe ? 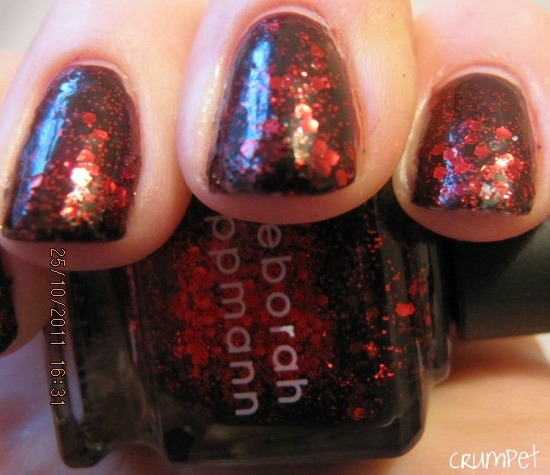 This is Lippmann’s legendary Ruby Red Slippers, a nail varnish that is fun, funky and totally redefines glamour. 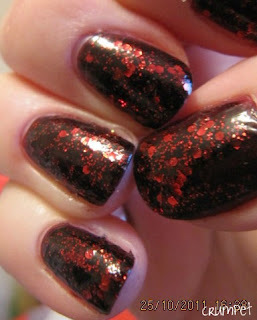 Red glitter and sequins are suspended in a browny black base varnish. Layer on to your heart’s desire for a look that is original, modern and the envy of your friends. 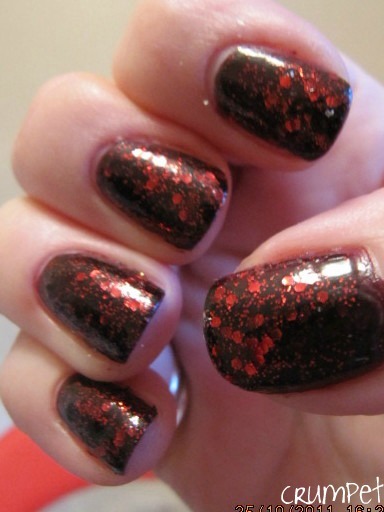 The red is bright and happy and although it’s not solid, catches the light to give an impression of jewelled nails. 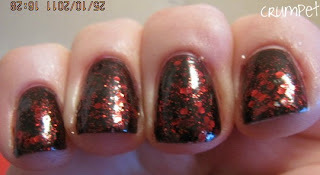 I have used 2 coats, but to be honest 3 might have been better – this looks like red fire stars twinkling in the night sky. The more you apply, the more depth you get to the red. Sensational and unique. A keeper. And that was all I said! Lol. These days I would advise you to wear something under the Lippmann, to minimise the number of glitter layers you need. I usually go for some sort of dark burgundy, and then 2 coats is enough to make your nails sublime. I also don’t think I captured how transfixing this polish is. 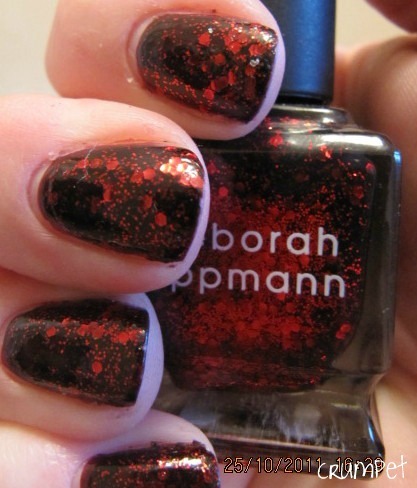 It literally does hypnotise me every time I wear it, but then I’m not sure I own a Lippmann glitter that *doesn’t*. This always feels very vampire-ish to me. Something about the darkness, then the bright clash of the blood .. ha ha, love it! 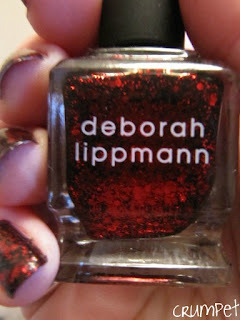 I absolutely adore this polish, and it was a real breakthrough for me in terms of what could be accomplished in a bottle. It totally redefined what I wanted a nail varnish to do, and was indirectly responsible for my escalation to Glitter Whore. I never ever wear this without getting gasps from other people. It really is SO special. It’s a genuine work of art and a thing of beauty. 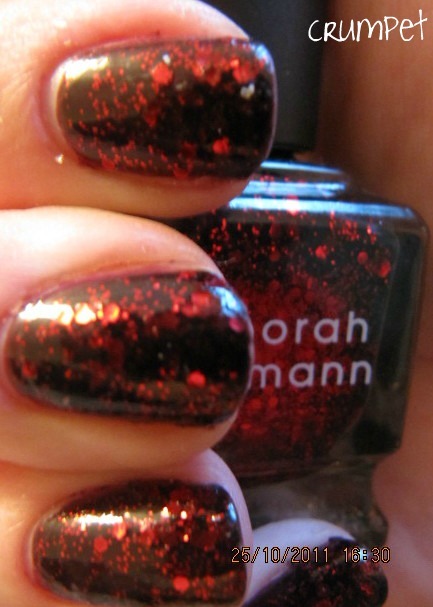 It also evokes an emotion in me that other polishes don’t – I feel a real emotional connection to this polish. Maybe it’s the price tag, who knows, but my oh my, this is undoubtedly one of the most important – and utterly beautiful – polishes ever made.